While it’s a given that Italy’s Lake Como sits on any list of must-see destinations, it also sits near the top of the somewhat smaller list – dominated, it seems, by Italy – of places one must see repeatedly. Despite the distance, a surprisingly large number of Australians are among those who flock annually, or at least regularly, to either Lake Como, the Amalfi Coast or Sardinia’s Costa Smeralda.Perhaps that partly explains the immediately familial feel of the Grand Hotel Tremezzo (grandhoteltremezzo.com), on Lake Como’s western shore (and directly opposite Bellagio, at the lake’s centre). The hotel’s youthful and energetic CEO Valentina De Santis, whose grandfather Giovanni Battista Mallone bought the historic property in 1975 and whose father Paolo De Santis instigated its major refurbishment earlier this decade, knows that more than 20 per cent of the hotel’s guests are regular clients – and seven per cent of guests each year are Australians.Perhaps it was ever thus. The 90-room, six-storey hillside building was opened in 1910 as the first hotel on the lake; though its Art Nouveau magnificence sat easily among the neighbouring, landmark private villas on this Tremezzina strip, such as Villa Carlotta (next door) and, a short stroll south, Villa La Carlia (aka Villa Pirelli) and the mysterious Villa Sola Cabiati (aka ‘La Quiete’) – of which more later.Grand Hotel Tremezzo is magnificent and intimate at the same time. On being welcomed into the magnificent foyer, one’s eye catches quirky details such as the relaxing lounge area and the cheeky, constantly full lolly jars. 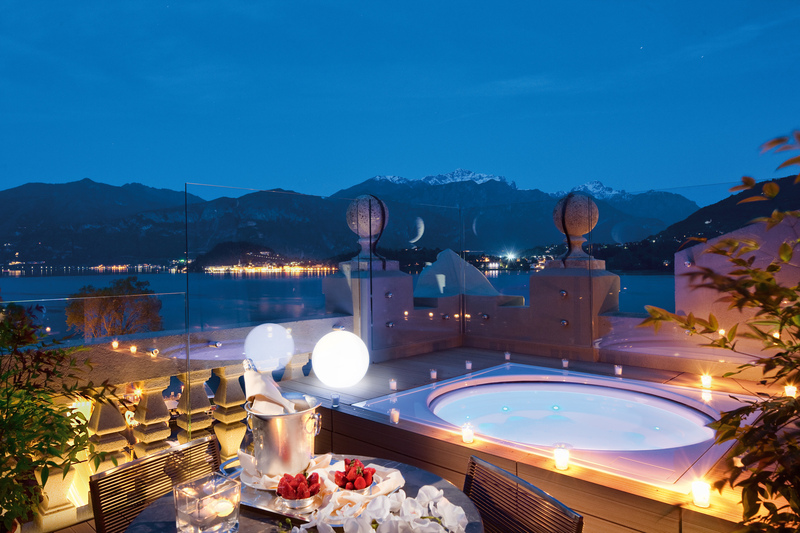 The view across the lake, dotted with ferries and classic timber speedboats, to the pastel villas and tumbling flower gardens of Bellagio and the mountains beyond, is taken in from the cosy terraces of the hotel’s Sala Regina or the more formal La Terrazza restaurants. The accommodation is broadly in three categories, with very spacious new rooftop suites having only recently joined the more traditional rooms and suites classified as either lake view at the front or garden view at the rear. The traditional rooms are compact in comparison with modern luxury hotels, but immensely comfortable, with opulent (and original) marble bathrooms and gorgeous Beltrami linen. Relaxing with a book on the lakeside room’s small balcony, one has the sense of being immortalised as a few brushstrokes in someone’s painting of this famous hotel’s façade. Another charming detail is the discreet daily delivery of a love letter, copies from a cache lovingly bundled and concealed in the hotel decades ago by an obviously adored, anonymous guest.The garden view rooms at the rear of the hotel open onto in the expansive, flower-ringed swimming pool and adjacent pizza bar, backed by walking trails that climb the quite steep hillside behind the hotel. Conversely, opposite the front of the hotel is Water on Water, a swimming pool floating on the lake, with its adjacent Beach outdoor restaurant. The hotel’s proudest fare is at the fine-dining l’Escale, with its extensive cellars.The De Santis family, being locals here for more than 40 years – and very much hands-on in this family business – help to unfurl Lake Como’s delights at one’s feet. The hotel’s two gorgeous timber boats, Ruy and Batt, can be taken for lake tours, such as to the landmark Villa Del Balbianello. A more recent and exclusive addition to the hotel’s portfolio is access to the private Villa Sola Cabiati, a 15-minute stroll away along the lake shore. Hailed as one of the lago’s most impressive villas, it is also perhaps the most original, having been scarcely used for the past century by its aristocratic Milanese owners. Grand Hotel Tremezzo can arrange access for weddings, dinners or sole-use occupancy (the latter at €30,000 a week), the result of a friendship between the De Santis and Sola Cabiati families. And that’s the thing in these parts: it’s about family.